A new Pew Research Center report of 32 emerging and developing countries looks at how the increasing use of the internet affects people’s daily lives in places around the globe. A picture emerges from the survey of how people perceive the internet’s impact on their lives, how many people access it and who they are, and what people are doing online. We also looked at smartphone and cell phone ownership rates, as well as the types of activities people do on their mobile devices. 1People see the internet as a good influence on education, but are skeptical of its effect on morality. Overall, people in the emerging and developing countries surveyed see the internet as having a positive effect on education, personal relationships and the economy. But they are wary about its impact on politics and especially on morality. 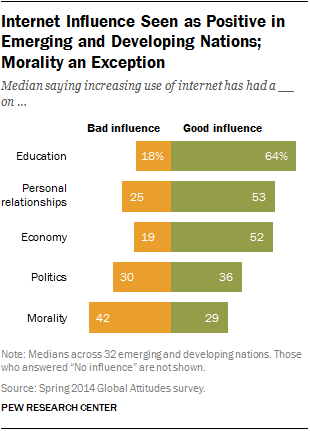 A median of 42% across 32 countries say that the internet is a bad influence on morality. 2The young, well-educated and English speakers use the internet more frequently. The internet is not pervasive everywhere. In fact, less than half of people in 19 of the 32 countries surveyed say they access the internet at least occasionally or own a smartphone. But young people (18-34 years old), the better educated (secondary or more education) and those who have at least some ability to read and speak English are consistently much more likely than others to be online. 3Across the emerging and developing countries, national income is strongly associated with higher internet access rates. Richer countries in terms of gross domestic product per capita are much more likely to have high rates of internet access, and poorer countries typically have fewer internet users. At some point, however, access in richer countries will max out, providing a chance for poorer nations to close the gap. As of January 2014, 87% of people in the U.S. (a very rich country) use the internet, and many envision a time when universal access will become a reality. 4Among the activities tested among online users, socializing, either with friends or family or by utilizing social networks, is the most popular choice. 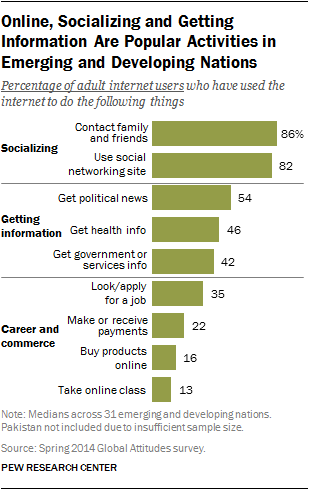 Meanwhile, getting information, such as political news, health advice or government services, is in the second tier of internet use, but still widespread. Commerce and career activities such as looking for a job, making or receiving payments, buying products and taking an online class are less common. 5Cell phones are nearly universal, but smartphones are less commonplace, at least for now. Nearly everyone in the 32 countries surveyed owns a cell phone (median of 84%). But while the smartphone revolution is in full swing, levels of smartphone penetration are far from universal. Only in two of the countries polled do more than half have a smartphone – 58% in Chile and 55% in China, on par with the 58% of Americans who report owning this kind of device. But as with internet access, the people buying these phones are young and educated, so the movement toward greater smartphone adoption is likely to continue.